We report a case of herniation of abdominal contents into the left hemithorax in a patient with a history of vague left-sided thoracoabdominal trauma 18 days previous to admission and who also had a recent 1-week history of upper respiratory symptoms, including cough, and then presented with dyspnoea and fever for 3 days. There was no preceding cardiorespiratory pathology of note. We also discuss the epidemiology, pathogenesis and management of blunt-traumatic diaphragmatic rupture. 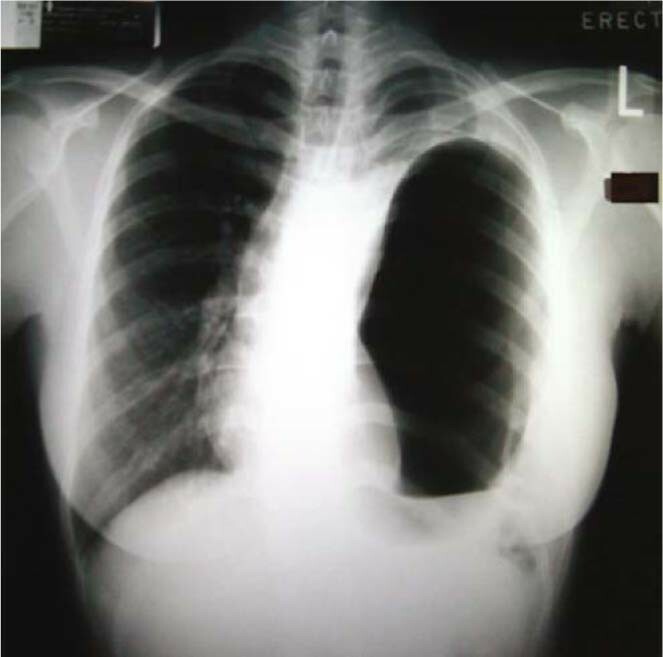 A further review of the radiograph, which demonstrated no paucity in lung markings above the left hemithoracic lucency, lead to the clinical suspicion of a herniated hollow viscus into the left hemithorax. Nasogastric tube insertion with repeat chest radiograph (Fig. 2) confirmed herniation of the stomach into the left hemithorax, as evidenced by the position of the nasogastric tube within the intrathoracic gastric air bubble shadow. The patient readily recounted that approximately 18 days prior to admission she had been kicked in the left thoraco-lumbar region during a game of ‘musical chairs’ at a party, but suffered no immediate ill effects. She was a reliable patient in terms of recounting her medical history and vehemently denied any other forms of trauma. Her epigastrium and left upper quadrant were tender without guarding or rebound but with decreased bowel sounds. We made a diagnosis of ‘pseudopneumothorax’ due to a delayed rupture of the left hemi-diaphragm secondary to thoracoabdominal trauma sustained 18 days previously. Repair of the rupture of the left hemidiaphragm was performed. Operative findings included: (1) traumatic rupture of left hemidiaphragm with a 15-cm defect in posterior aspect; (2) herniation of stomach, spleen, omentum and splenic flexure into the left hemithorax; (3) 5-cm-diameter necrotic perforation of the greater curve of the stomach, thus provoking a decision for partial gastrectomy (Bilroth II); (4) a splenic capsular tear which was haemostased with surgicel. Post-operatively, a left pleural effusion was successfully managed by tube thoracostomy drainage. The patient was eventually discharged on the 15th postoperative day. We present a case of ruptured diaphragm with eventration of the stomach mimicking a pneumothorax. Prompt diagnosis avoided inappropriate chest tube insertion. The development of diaphragmatic injury post-blunt trauma is reported in less than 5% (0.8–5%) of cases of blunt trauma. [1, 2, 3] Pre-operative diagnosis is only made in 40–50% of left-sided blunt diaphragmatic ruptures. In 10–50% of these cases, diagnosis is delayed beyond 24 hours post-trauma. Approximately 1% of diaphragmatic ruptures are reported as being ‘spontaneous’ and are attributed to varied precipitating factors, including coughing. A sudden and forceful Valsalva manoeuvre, as in coughing, with resultant expiratory muscle dyscoordination coupled with the intra-pleural pressure swings and repeated coughing spasms may result in diaphragmatic rupture. [4, 5] This is especially the case with inherent diaphragmatic weaknesses from preceding blunt trauma. Diagnosis of diaphragmatic rupture is commonly made via chest radiography (40.7%), as in our case study. Management of diaphragmatic ruptures comprises two aspects: (1) resuscitation of the patient and (2) definitive management of the diaphragmatic rupture and its associated complications; this involves surgery in even the smallest tears as these do not heal spontaneously and because the parietoperitoneal pressure gradients favour enlargement of the defect and thus visceral herniation. While the diagnosis is usually made acutely, late recognition occurs in 14.6% of cases with a delay in diagnosis that ranges from 20 days to 28 years. Reported complications include paralysis and dyscoordination of the diaphragm and incarceration of abdominal viscera and their sequelae. In our patient’s case, it is probable that she sustained trauma and tear of her hemidiaphragm when she was kicked on her left side. 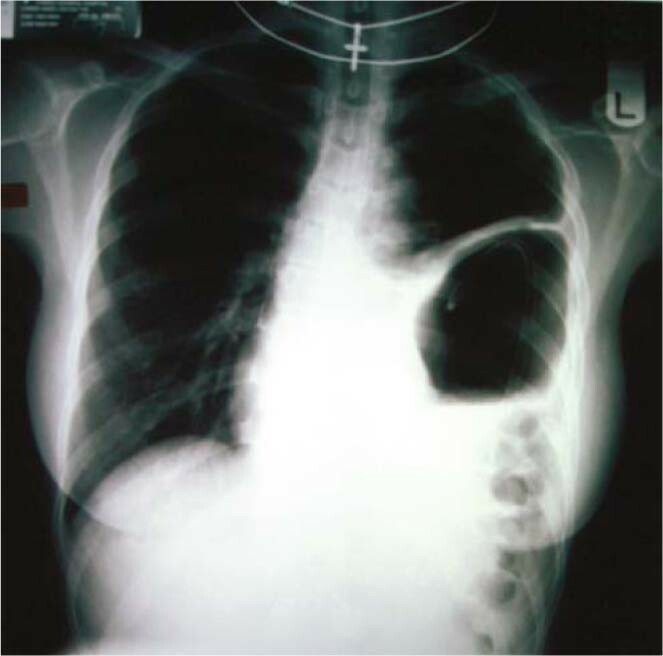 Her symptoms of an upper respiratory tract infection and paroxysms of coughing subsequently precipitated herniation of abdominal viscera with dyspnoea 2 weeks later. The diagnosis of diaphragmatic rupture can be difficult to make and is frequently overlooked in blunt abdominal trauma. In addition to advising clinicians to maintain a high degree of suspicion, we advocate the insertion of a nasogastric tube in the scenario of a hemithoracic air bubble on a chest radiograph as a cheap and simple bedside diagnostic manoeuvre in the differentiation of a gastric air bubble and a bulla. Our patient was unusual in that the trauma occurred more than 2 weeks prior to presentation.